I belong to a book club whose members meet every six weeks, taking it in turns to choose books for group discussion. When I recently announced that my next choice was Room by Emma Donoghue, I was greeted by a sea of concerned faces. Room is told in the voice of a five year-old boy, Jack, who lives with his Ma in a room measuring 11 feet by 11 feet. Ma and “Room” are his whole world – the implication being that it’s a situation similar to the real life stories of Natascha Kampusch and Elizabeth Fritzl who spent years locked away in hidden rooms against their will. It was hardly surprising that my book club friends had doubts about my choice. But by the time our book club discussion came around, they all agreed that Room is a worthy read. 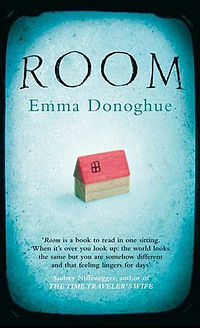 While the subject matter has dark and depressing undertones, Emma Donoghue takes our focus away from that and places it firmly on the dynamics of Room. Jack is oblivious to the outside world and the circumstances that led to Room. It is heart-warming to view the world through his child eyes. However, this is also a story about Ma. Through Jack’s narration, Emma Donoghue provides an insight into what life might be like for Ma. What would it be like to live confined to a small room with a young child? What would you tell your child if you lived in Room? How would you protect them and give them the opportunity to live their life to the full? What would you do as your child grew older and became aware of the world outside? This is the story of Room. Would you like to read Room? *Please note: I have selected these sites to give you access to low prices with free delivery. You won't pay any more if you buy this book from these sites, but they will give me a small referral fee (5%). Such a wonderful treat reading this book was,bcoz it was like NOTHING I'VE EVER READ BEFORE! It takes you out of your comfort zone and plunges you headfirst into the plight of others,the likes of which you had never ever imagined!! Very beautifully narrated through the eyes of a little child, who is completely unaware of the world that exists outside the small room in which he and his mother are living a poor life as captives. An AMAZINGLY written book that deals with a very POWERFUL issue, but does so with great sensitivity that is Gauranteed to MOVE YOU!!! The storyline will keep you captivated and make you turn page after page till the very end. I very highly recommend it what has my new FAVORITE as a MUST READ for avid book lovers!!!!!! !